The Anniversary Edition of Madden NFL 25 on Amazon will come with a code for a one-year free subscription to NFL Sunday Ticket on computer, tablets and mobile devices. So you like football, eh? 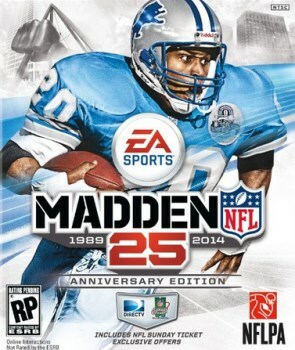 Allow me then to direct your attention to the forthcoming Madden NFL 25, which is not actually the 25th game in the franchise but rather just a franchise that's 25 years old. But that's neither here nor there - what's relevant to our interests is the Anniversary Edition of the game, which includes a pretty sweet bonus for those who do in fact like football. NFL Sunday Ticket, according to the DirecTV website, offers dedicated fans access to "every out-of-market game, every Sunday," and not just highlights but the whole shebang. It's not cheap - $45 per month for a five-month season, or save $0 with a one-time payment of $225 - but that's where Mr. Madden comes in. Buy the Anniversary Edition of his anniversary game and you'll get a code for access to the 2013 regular season of Sunday Ticket, totally free. The free subscription is limited to access through computers, tablets and mobile devices, but consumers within the DirecTV footprint can get $10 per month off their first year subscription to the regular, "on the big screen" service, plus an upgrade to NFL Sunday Ticket Max at no extra charge. The Amazon-exclusive Anniversary Edition will also include a free 17-week Madden Ultimate Team pack subscription. It isn't cheap - the regular edition of Madden NFL 25 goes for the usual $59.99 but the Anniversary Edition will set you back a cool 100 bucks - but $225 to watch a season of football (or $300 if you go the Max route) is pretty pricy too. I'm not a football fan so I'm in no position to judge, so you tell me: is this any kind of reasonably good deal? EA says only 100,000 copies are being printed, 50,000 each for the Xbox 360 and PlayStation 3, so if the answer is "yes" and you want one, you might want to think about a preorder.